No one knows better than R.N.s and other health professionals who counsel patients on good nutrition that the health benefits of a vegetarian diet are huge. Replacing red meat with veggies often leads to lower blood pressure, reduced risk of heart disease, diabetes and certain types of cancers. Going vegetarian is a healthy lifestyle change, but only if you’re getting the recommended daily requirements of calcium, protein, Vitamins D, B-12 and iron. Here’s a shortlist of how to cover those bases, and links to healthy recipes that can help you meet your vegetarian goals. • For protein: The American Dietetic Association (ADA) says that eating a wide-variety of plant based foods with enough calories satisfies the daily protein requirement—50 grams per day is optimal. Vegetarians can get a protein rich diet in whole-grains (think oatmeal), lentils, beans and low fat dairy products. The list includes tofu, seeds and peas. Check the healthy careers website for Sloppy Joe’s With a Tofu Twist. • For calcium: The ADA recommends adults get 1,000 mg a day of calcium; that’s 3 cups of milk or yogurt. Since many vegetarians are also vegan, this presents a challenge. 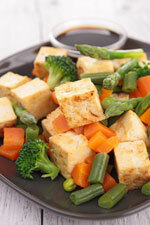 Here’s a low-fat, plant-based way to get your recommended allotment of calcium. Load up on dark, leafy greens, i.e. bok choy, spinach, kale, collards and turnip greens, broccoli, beans, dried figs, and sunflower seeds. • For Vitamin D: This is the nutrient that helps your body better absorb calcium. You can get a nice dose of it by being out in the sun, but when you’re looking to fulfill the 200 IU daily requirement in a plant-based way, look to soy beans. • For iron: A range of 10 to 20 mg a day is recommended. Cooking your food in iron pots and pans can help increase your daily intake, but it’s the iron-rich foods that get tossed in that really matter! Eat dark green veggies, like spinach and broccoli, iron-fortified breads and cereals, dried fruits (i.e. prunes), pumpkin seeds, sesame seeds, and foods high in vitamin C, like oranges, lemons, tomatoes, and green peppers–use the zest from lemon peels for great health benefits and start juicing if you can! • For B-12: This is produced by animals and good bacteria in soil. Vegans must take a vitamin supplement to meet the daily requirement of 2.4mcg. Vegetarians can achieve their quota, via dairy products, including eggs. Whether you go vegetarian or not, adding more fruits and vegetables to your daily diet is a wonderful idea. Check in with Healthy Careers to get some great recipes, or share your own via a healthy recipe contest. You can also spread the word about vegetarianism—it is, after all, an opportunity to promote joy, compassion and life enhancing possibilities—all the things that travel nursing brings in R.N. and therapy jobs across this great nation. May this year’s harvest be plentiful for everyone! **Facts for this blog were taken from http://www.eatright.org and The Vegetarian Times. Previous Previous post: Travel Nursing Adventures Include the Local Farmers Market!